To generate ultrasound oscillation, PI Ceramic offers optimized PICMA® Chip miniature multilayer piezo actuators for resonant, high dynamics operation. PI Ceramic manufactures new ring chips in multilayer technology that allow resonant operation. This means that it is possible to generate oscillation with frequencies of up to 100 kHz with an operating voltage of a few volts – a combination that has not been offered before in series production. The technology is particularly interesting for devices in mobile applications such as for example, ultrasonic scalpels or for generating aerosols in medical devices. The low voltages make battery operation possible and rule out any health risks. The mechanical quality factor of the modified PIC182 piezo material is high and that allows comparatively large mechanical displacement in resonance mode. The chip actuators are offered as disk or ring and the standard outer diameters range from 8 mm to 16 mm. Customized dimensions and shapes are also possible. 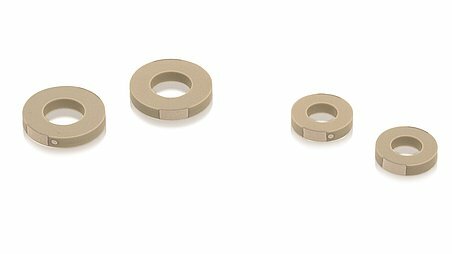 The new multilayer piezo actuators have precision-ground end faces and all-ceramic insulation, which makes them suitable for use under high mechanical preloads. PI Ceramic is considered a global leading player in the field of piezo actuators and sensors. The broad range of expertise in the complex development and manufacturing process of functional ceramic components combined with state-of-the-art production equipment ensure high quality, flexibility and adherence to supply deadlines. Prototypes and small production runs of custom-engineered piezo components are available after short processing times. PI Ceramic also has the capacity to manufacture medium-sized to large series in automated lines. PI Ceramic, a subsidiary of Physik Instrumente (PI) GmbH & Co. KG, is located in the city of Lederhose, Thuringia, Germany.